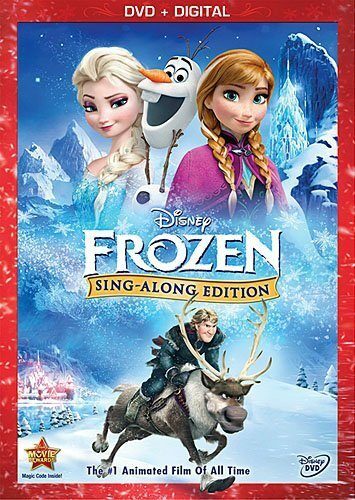 Pre-Order Frozen Sing Along Edition For $17.86 - Low Price Guarantee! You are here: Home / Great Deals / Amazon Deals / Pre-Order Frozen Sing Along Edition For $17.86 – Low Price Guarantee! Pre-Order Frozen Sing Along Edition For $17.86 – Low Price Guarantee! Calling all parents of Frozen fans – it’s time to pre-order the Frozen Sing Along Edition ! Grab it now on DVD for $17.86, down from $30! And, shipping is FREE with Amazon Prime or Super Saver Shipping! My daughter has been dying to get this version of the movie, so I’m really excited that it’s available for pre-order now! And, don’t worry – if you pre-order it now and the price goes down, you’ll get the lowest advertised price! Experience FROZEN, hit musical comedy from Walt Disney Animation Studios, like never before in an all-new, full-length SING-ALONG EDITION! Follow the lyrics with a bouncing FROZEN snowflake. Join Anna as she sets off on an epic journey — teaming up with rugged mountain man Kristoff and a snowman named Olaf — to find her sister Elsa, whose icy powers have trapped the kingdom of Arendelle in eternal winter. It’s pure enchantment — and full of fun for the whole family!